Liverpool produced a performance of two halves against Burnley on Wednesday night, with several individuals singled out for praise in the 3-1 win. The Reds built on their dramatic derby victory over Everton with a professional three points at Turf Moor, although for a while it looked like their Premier League title chances were being dealt a blow. Jack Cork’s scrambled opener arguably shouldn’t have stood, both for offside and for a foul on Alisson, but Liverpool didn’t let it affect them. The evergreen James Milner equalised with a precise finish, substitute Roberto Firmino scored with his first touch and Xherdan Shaqiri completed the scoring in stoppage time. It was the latest example of a game the Reds would not have won a few years ago, with their belief, quality and fighting spirit all coming to the fore. 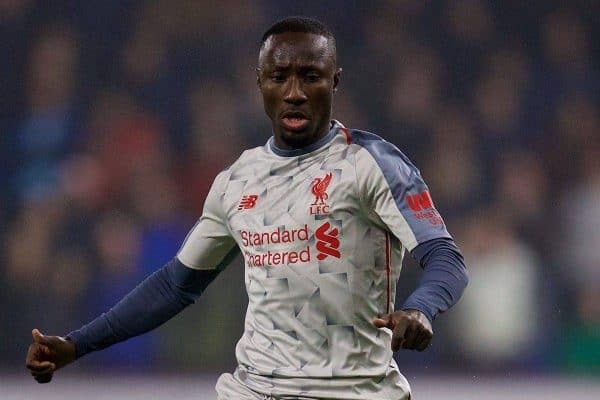 Naby Keita (7.6) was outstanding on the night, showing real quality in the middle of the park and enjoying his best game for Liverpool by some distance. This is Anfield’s Henry Jackson described his display as “very promising”, while the Liverpool Echo‘s Ian Doyle felt the Guinean’s attacking class “sparked the Reds into life” after the break. 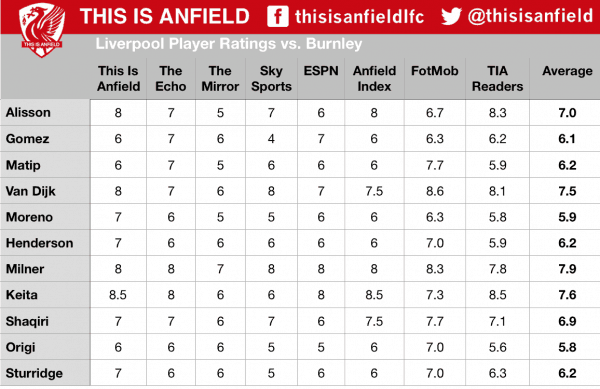 Milner (7.9) was the highest-rated Reds player at Turf Moor, however, and ESPN‘s Glenn Price felt the veteran “stepped up when Liverpool needed someone to”. 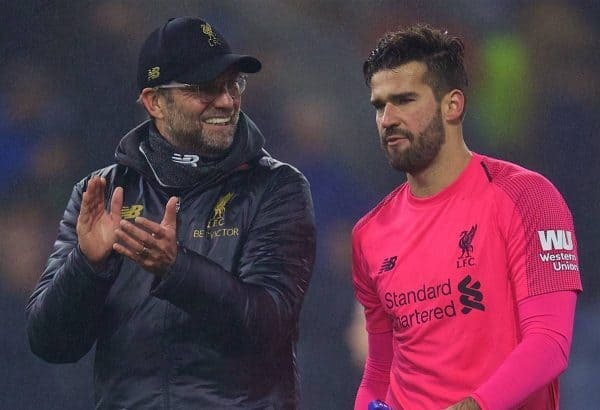 There was also praise for Alisson (7.0), who made a vital last-gasp save before starting the move that Shaqiri ended up scoring from. Jackson felt it showed why the Brazilian is “worth every penny of his fee” and The Anfield Wrap’s Ben Johnson described his involvement in the third goal as “unreal”. Given some of the other ratings from that particular direction, it has to be questioned if the entirety of the match was really being taken in. Next up for Liverpool is another testing away assignment, as Jurgen Klopp and his players head to Bournemouth for the Saturday lunchtime offering. A win takes them top of the Premier League, with Man City travelling to Chelsea later in the day.